I am back guys! Been busy this past few weeks that's why I haven't posted for a while. I got new code snippets to share that maybe important using bootstrap modal. Most of the newbies in bootstrap doesn't know how to update records from a list and display it in a bootstrap modal like in the image below. I have here the files. You can download it here Update record using bootstrap modal, unzip it and then try to follow the procedures in running it. Put it in your xampp/htdocs if you're using XAMPP or wamp/www if using WAMPSERVER. Open your phpmyadmin in your web browser by typing localhost/phpmyadmin in your address bar. Create a database and name it inventory. But you can change that depending on your system. Import the sql file from dist/db/inventory.sql. Open the file dbcon.php from the folder dist/includes and change the last value to inventory or your desired database name. 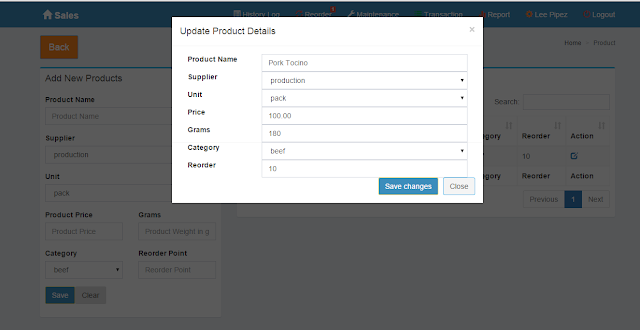 Change the product to the table you want to display in the list. Change the content between the brackets ['column_name'] the name of the column you want to display. Change prod_id to the table's primary key. Same column in step 4. Change product to the table name you want to store the data. You need to change all columns found in you table.